Pops is a first year Boomer. He will occasionally post stuff here that reflects a Boomer vantage point. OK, now I've got the t-shirt to prove it. The last couple of days we've ridden in a taxi, on the bus, on the subway and on the elevated train. Plus walked miles, literally. Monday, walked from the hotel past the park to the Sony Center. What would you find there but a Dunkin' Donuts shop. I did have a donut, but not a jelly. On to the Geography of Terror exhibit, which is also adjacent to a section of The Wall. Then Checkpoint Charlie. Some of the stuff we saw quickly on the bus tour. Then lunch - a really good margherita pizza and a couple of beers. In the former GDR (East Berlin). Bundestag museum, a cathedral, then on to Brandenburg Gate. Back through the park, past the Soviet memorial, the Victory Spire, through the zoo and back to the hotel. Google maps said it was a little over 7 miles. 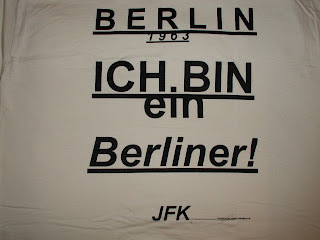 A good part of this was in East Berlin. Amazing to contemplate - the wall came down less than 20 years ago. 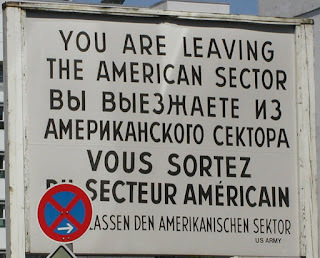 Yes, we definitely left the American Sector. In fact, everything past Checkpoint Charlie, and some before (see below) were in East Berlin, until we were past Brandenburg Gate. This is a section of wall adjacent to the Geography of Terror exhibit. 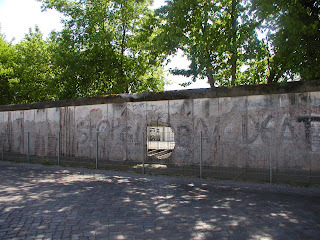 This was taken from the East Berlin side. More later. Got pipeline business to attend to early in the morning. What Happened: Inside the Bush White House . . . I'm an aging first-year Boomer in Houston in the Energy Industry. Married, children, grandkids & granddogs. What more can be said.